With the New Year comes a very common pastime - people vowing to change their lives for a new way of life. Resolutions are made and normally broken within a week's timeframe, leaving a hollow emptiness around the "New" in "New Year". Las Vegas, though, has a different grasp on the holiday, using it as a send off for such venues as the new RPM nightclub in the Tropicana Hotel and Casino. Kicking off with a show that none shall be soon to forget, RPM promises the most energetic start to the 2012 New Year. As with any new, trendy nightclub, RPM is sure to become the new home for the stars. 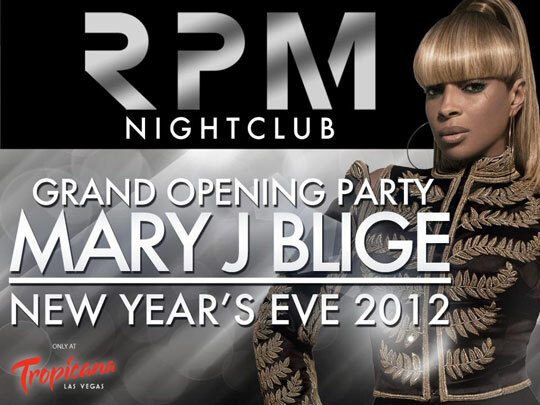 The New Years Eve party, headlined by Mary J Blige, is bound to bring in a few faces familiar to the paparazzi. First-class guest DJ's also promise to grace the club's extravagant DJ booth to spin a mix of hip-hop, Top 40, and RPM's own house music. RMP's resident DJ, sourMILK, will keep the party rocking and the dance floor overflowing. To compliment the club's world class DJ, RPM will also feature dancers and specialty acts to appeal to every sense. RPM's space comes in at a hefty 16,500 sq ft, giving the club plenty of space for its lavish three bar arrangements and plenty of booth-style seating for its guests. Elegantly styled wood and polished chrome accents create an element of class in this modernized nightclub. Each of RPM's bars will offer a vast array of fine liquor, wine, and beer – all a necessity for a great party in Las Vegas. To ensure its guests won't leave to get their gamble on, RPM features an array of table games and roulette set up in the club's Gaming Lounge. The inclusion of this extra entertainment not only ensures the RPM stays a step ahead of most other nightclubs on the market, but also that its guests won't grow weary of the same nightclub scene. To ensure that the party doesn't die out during the work week, RPM has created a line-up of weekday events on Wednesday and Friday to counteract the dreary workday. Wednesdays will be home to the currently named Industry Day. RPM leaves its doors open on Wednesday evenings as an invitation for all those hard working individuals that keep the city running. To spin a healthy mix of the club's signature music, DJ Hollywood will take up residency for Industry Day. WTF Fridays will act as the official beginning of the weekend, with celebrity guest appearances and special performances that will change on a weekly basis. WTF Fridays will pull you out of that weekly rut caused by the dreary Monday through Thursday stretch. Continuing the weekend party, Saturdays will be Unleashed by a slew of celebrity hosts and surprise performances. RPM is lining up to be the new club of the year, and with an attached gaming lounge, will surely provide entertainment for many years to come. Contact Vegas VIP Services to reserve your Bottle Service at RPM Las Vegas. To Post a RPM Review now.. I was at the Club Nikki and it was great especially its pool, I am not sure what the problem with this nightclub was but they weren't very succesful although it backed by a big name. I hope RPM won't have the same failure, its a upscale nightclub and hope this time they will make it.